Apr 16, 2019 | What Am I Reading? Just like a box of chocolates, Anne Tyler’s writing is comforting and moreish, but unlike Gump’s chocolates, you do generally know what you’re going to get: well-developed and engaging characters; tricky family situations or relationships; and great arcing overviews of a life in all its stages. 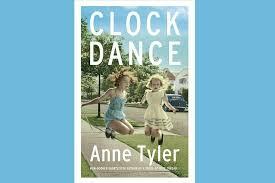 Her latest novel, Clock Dance (Penguin Random House 2018) is immediately obvious as an Anne Tyler book, and readers can open the pages in anticipation of the humour and poignancy they have come to expect. Clock Dance has rather an unusual structure, however. The first half of the book comprises snapshots of moments of great import in the life of the protagonist, Willa Drake. The first section is set in 1967, when Willa is 11 years old, and her mother disappears. The second is in 1977, when at age 21, Willa is proposed to, and the third is in 1997 when she becomes a widow at only 41 years of age. Through each of these defining moments, Willa takes the path set out for her by others. The second half of the book is set in 2017. Willa is 61 years old and gets a call from a friend of her son’s ex-girlfriend, to say that Denise (the ex) has been shot, and could Willa please come and care for Denise’s nine-year-old daughter and their dog? Willa doesn’t know these people – she can’t even think why they would have her number – but something compels her to get on a plane and travel halfway across the country to help. Because she is needed. What she finds is a woman who needs her in ways she hasn’t been needed for years, a little girl yearning for a grandmother, and a community of eccentric characters who open their arms and welcome her. As she sets about doing what she can, despite the improbability of the whole situation, Willa finally begins to understand the meaning of her own life and realises that it is never too late to choose your own path. Anne Tyler’s characters are always so complex and relatable, and her dialogue is spot-on – you can hear the people talking. And the humour and wit in this story is both funny and cringe-worthy. We know people like these people, we have had conversations with them, we are related to them, they are our neighbours and friends. And despite everything – her lost husband, her distant sons, her strange mother and her dear father – Willa at last, in her sixties, finds herself.